Isobutyric acid is an organic chemical compound with the chemical formula (CH3)2-CH-COOH. It is an isomer of butyric acid. It's mainly used in the synthesis of isobutyric acid esters. It can also be used as edible flavor and in pharmaceutical. An other use is for production of the perfume ester. 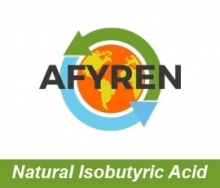 AFYREN produce a 100% biobased Natural Isobutyric Acid with a respectful process for environment and non GMO natural microorganisms. The raw materiels used are also non GMO.